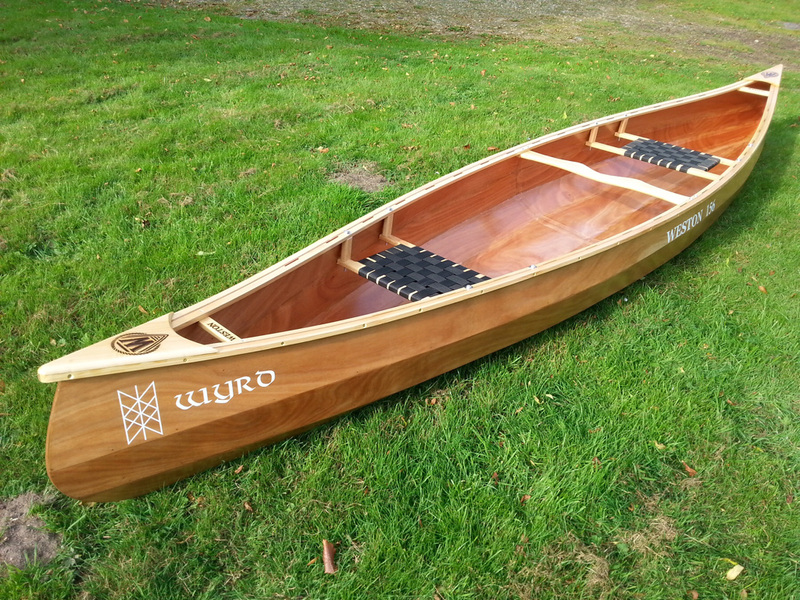 These are wooden canoes made in Norfolk, and also used by the builder in a hire and tour fleet through Norwich, that he also runs. Individual commissions can have custom modifications and finishes as per customers wishes, as they are built to order. They are made in 3 standard lengths from 14 foot, 14 foot 9 inches, and 15 foot 6 inches, although other lengths can be built to order. They are a multi chine stitch and glue design, then glass and epoxy sheathed, then varnished, hulls being made from Okoume marine grade ply. They have more chines than some designs giving a slightly softer, less boxy shape to the hull than some others. The ends are fine and reinforced with an epoxy fillet for strength, and the hulls symmetrical fore and aft and incorporate a gently rising sheer with a radial bow and stern like a less extreme Charles River. I don't profess to be any expert in canoes and design and at time of writing this, I consider myself new to this wonderful type of boating; but I am in a position to comment in comparison to one or two other designs in terms of my usage for this boat which is predominantly flat water, lakes, Broads (it's birth place)and gentle rivers. Being wood, its no boulder basher! The particular model I am reviewing is the 156, at 15 foot 6 inches, the longest (standard) model. This boat is available with a third seat and a kneeling thwart, but for mine I elected to not have these, and when solo, I kneel, reversed, on the front seat. It has, more obviously, a hand carved carrying thwart. My paddling is split between 2 up with my partner and solo, about 50:50 and the 156 is perfectly at ease doing this, still with abundant carrying capacity for camping gear if wished. An important consideration is the weight...my finished boat weighs 27kg. and is easily lifted and carried. As a comparison my friends 16 foot NovaCraft PAL in "TuffStuff", is just under 25kg, and my polypropylene Old Town Charles River (over 15 foot) is pushing 40kg. That's a huge difference and also makes itself more noticeable than some may appreciate on the water, the lighter boats being far more reactive and easy to accelerate. Unlike the Charles River, which has a flat bottom; the Weston has a slight chine running along the keel line which has several effects; it enables the boat to track well, and reduces wetted area, making it again, quicker, with a tad less primary stability. But also the design incorporates a slight fore and aft rocker, only slight, an inch or so, which makes it easy relative to those boats with none, to turn. It's no Prospector in this regard, though! "First short solo and then a longer 2 up paddle in the company of a Tuffstuff Nova Pal, also 2 up. Flat water. Weight for a 15 foot 6 inch canoe (Weston 156) came to 27 kg, compared to my plastic Charles River pushing 40 kg. Has very slight fore/aft rocker, and a shallow chine, along the keel line. This and the lightish weight contributed to very slight initial "tippyness", but also a relative lack of wetted surface area and makes it a relatively easy and quick boat to accelerate. Whilst easily able to hold a line, is also quite capable of turning fairly quickly, ...Subsequent stability one or two up, is fine..."
On initial paddling for its first season, very happy with the performance, a very suitable and keenly priced alternative to many plastic "recreational" ( whatever that means) canoes.......touring, tripping, all fine, good load carrying, quick and easy to use. And a wooden boat chuckles to you as you go! Dependant on model these boats can comfortably do all of that and certainly the 156 works well 2 up or as a solo boat, whether out for the day, or for multiple days........These are robust canoes, and Nick Hannington, the owner and builder of Weston Canoes, was extremely welcoming when I visited, very open to various ideas that I had, even when they didn't work (that'll be most! ), and kept me completely up to date with various photos of the progress. He even delivered the boat, personally. 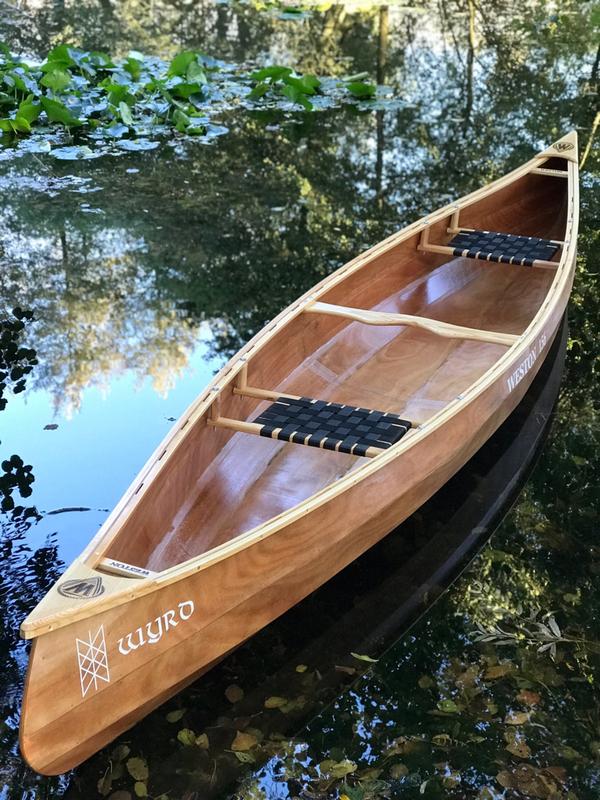 If you want an affordable wooden canoe, that performs, but can't, or don't want to build your own.....have a look? Or go and try one out and have a paddle at Norwich and take in a pub lunch by the water as you go? Couple of pictures Lawrence sent me to add. Not sure I'd like to bump it down a boulder strewn river though. Out of interest, what does it weigh ? Canoeist,Bushcrafter,cyclist, Jack of all trades and master of none. Thank you, but you haven't read the review, have you, tsk!? It weighs 27 kg. I don't think any wooden boat would be first choice for rock bashing! Can I ask a random newbie question about these canoes? Why is their maximum load so much lower than an equivalent plastic boat, or am I mistaken? Cryptic, too, that is, sorry I am? Humour sense weird of have I. For a "random" question, I thinks that's a good one insomuch as I've not given it much thought because the 156 can carry 3 adults AND gear....not that I would, as I specified mine to have only 2 seats/thwarts, which means it'll all but carry the car! With 2 of us, and I'm a big bloke, Wyrd will carry another 100kg should I want to, according to the specs.? More seriously I wonder, if there is a significant difference, could it be due to the slight v hull, which will therefore sit lower in extremis compared to a flat wide hull? I'm not really convinced by my own argument...…………. Could it just be that the structure will not be as robust as a 3 layered polypropylene 40 kg behemoth? Thanks - I was just struck by the difference between the 3-man and say a Hou 16 at 250kg plays 460kg, which is very significant, hence the question. …..or perhaps the builder is being conservative? My Charles River quotes a payload of nearly 1/2 tonne as well...but it weighs almost that!! However, Wyrd has higher topsides than the CR for much of it's length, too (though lower ends)...….so I'm none the wiser!! Last edited by laurence milton; 3rd-January-2019 at 04:04 PM. I've been meaning to adjust those figures for a little while. Those figures are not strictly max capacities. To be honest I have never done any 'lab condition' stress testing as such so I'm not sure what the exact maximum capacity is. But the canoes are fibreglassed on the inside and outside and are extremely strong when it comes to carrying weight. I would confidently say that you could add at least 100kg on top of those numbers before you have any issues at all. When I came up with those figures they were more like weight limits for the people themselves. I didn't want people optimistically buying a two seater canoe and then trying to squeeze 3 or four people in, at which point stability would be the issue not the strength of the boat. In the same way, if 2 larger-than-average people want to buy a canoe I would recommend the Weston 156 as a more stable option than the 149.